Officials Making Accusations: U.S. Senate; Dozens of states attorneys general; U.S. Justice Department. Accusations: Hiding the cardiovascular risks of Avandia and promoting it as safe for heart health when the drug, in fact, increased heart risks. Fines and Penalties: $3 billion with the federal government; $90 million with 38 states; $229 million with eight states. GlaxoSmithKline paid billions of dollars to the U.S. government to settle allegations the company hid the risks of its Type 2 diabetes drug Avandia and marketed it improperly. The drugmaker has continued to insist the drug is safe and effective, but admitted it failed to report clinical data. State and federal prosecutors, as well as U.S. Senate investigators, accused GlaxoSmithKline of actively concealing the serious heart risks associated with Avandia and misleadingly promoting the diabetes drug as safer than alternatives. GSK in 2012 pleaded guilty to federal charges that it failed to report clinical data on Avandia. The company was forced to pay $3 billion to the federal government and a total of $319 million to 46 states. GSK also set aside $3.4 billion to settle individual Avandia lawsuits that accuse the drugmaker of failing to disclose the potential of serious side effects linked to taking Avandia. A February 2010 report on a two-year investigation by the U.S. Senate Finance Committee accused GSK of failing to report a company-sponsored study that was completed in November 2003. In the study, patients given Avandia had more heart problems than those given placebos. A November 2003 GSK study linked Avandia to heart problems. The Senate investigation also revealed that GSK’s own 2006 meta-analysis of dozens of Avandia studies established that the drug increased the risk of serious heart problems by nearly a third. The Senate report concluded GSK knew of the cardiovascular dangers associated with Avandia and “took [steps] to create doubt regarding negative findings about the drug.” The Senate report urged the FDA to take Avandia off the market, but the agency declined to do so. A few months later GSK came in for more censure when company documents uncovered by The New York Times revealed that in 1999, GSK set out to determine if Avandia was safer for the heart than Actos, a similar medication made by Takeda. Not only was Avandia found to be no better than Actos, it was actually riskier. But instead of publishing the study’s outcomes, the company covered them up, according to The Times. In July 2012, GSK pleaded guilty to federal charges that it failed to report clinical data on Avandia and that it misbranded and unlawfully promoted the drugs Paxil and Wellbutrin for off-label use. Avandia was part of one of the largest federal health care fraud settlements in history. The company reached an agreement with the U.S. Department of Justice to pay a $3 billion settlement. According to the U.S. government, between 2001 and 2007, GSK omitted certain safety data about Avandia in reports to the FDA. The reports are meant to allow the federal agency to determine if a drug continues to be safe for its approved uses and to identify drug safety trends. Among the missing information was data from certain post-marketing studies. The company also failed to include data from two studies conducted in response to European regulators’ concerns about the cardiovascular safety of Avandia. 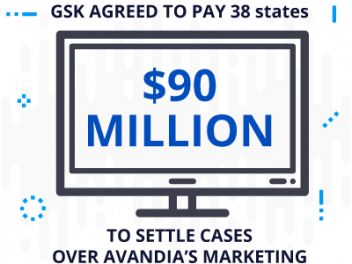 Thirty-eight state attorneys general sued GSK over its marketing of Avandia. They alleged that the company had, without evidence, represented Avandia as a medication for lowering cholesterol, and promoted it for having cardiovascular benefits when in fact it might have increased cardiovascular risks. GSK agreed in November 2012 to pay $90 million to settle the cases from the 38 states. GSK also promised to change the marketing and promotion of all of its diabetes medications. The company did not, however, admit to any wrongdoing. Nine states opted out of the earlier action against GSK. In July 2013, the company agreed to pay Louisiana, Kentucky, Mississippi, Maryland, South Carolina, New Mexico, West Virginia and Utah a settlement of $229 million, Reuters reported. GSK said it was settling to avoid a lengthy trial, and that it was not admitting any liability for the same charges as states made in the earlier case. Health care insurer Humana Medical plans sued GSK in November 2010. Humana cited the drug manufacturer’s settlements with individuals who sued the company. It said that dozens of those patients were covered under Humana’s Medicare Advantage Insurance, and that the federal Medicare Secondary Payer Act gave private insurers a right to sue for reimbursement of the health care costs they paid as benefits. The Third U.S. Circuit Court of Appeals ruled for Humana. GSK attempted to appeal to the U.S. Supreme Court, but the court declined to consider the case. As concerns surrounding Avandia’s potential to cause cardiovascular complications rose, European regulators stopped sales of Avandia in 2010. European officials halted sales of Avandia because of heart risks. The FDA revised Avandia labels in September 2010 and February 2011 to indicate cardiovascular risks, and forced GSK to pull Avandia from pharmacy shelves, making it available only through a special government program. However, in 2013 GSK completed a multi-year trial called RECORD that the FDA had directed it to perform. The trial reportedly found no risk for adverse cardiac outcomes. Based on that outcome, in late 2013, the FDA removed restrictions on the prescription and sale of Avandia.